This is so simple it doesn't really warrant a recipe as such. Take your tenderloin, remove all visible fat and make a long slit lengthways. Flatten out as much as you can without breaking the meat apart. 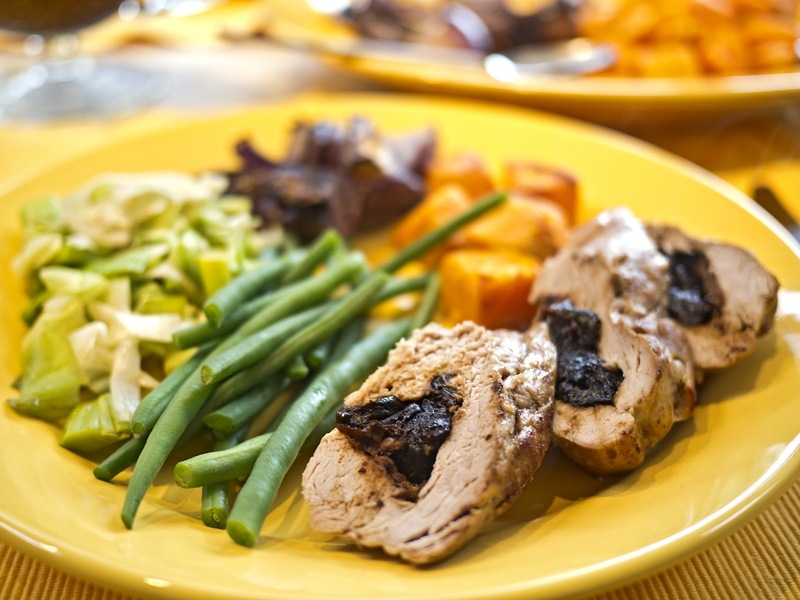 Stuff with prunes (bearing in mind that you are allowed 85g of semi-dried ready to eat prunes as your Healthy Extra B – I found I used around 100g for the whole tenderloin, which will serve 3-4 people) and roll up tightly, securing the ends with string or cocktail sticks. Bake in the oven on 230°C for about 30 minutes, until cooked through. Serve with vegetables of your choice, remembering to remove the string or cocktail sticks before serving. We enjoyed the pork with roasted sweet potatoes, sautéed leeks, steamed green beans and roasted red onion.